Get a free Memories Stitched With Love calendar filled with creative activities and inspirational content from Annie’s and KIWI magazine when you buy any Annie’s Homegrown product. It also includes coupons! 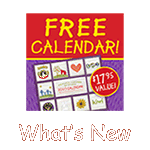 You can browse through the calendar on the web site to see what it includes. Click here to sign up! (You will need to enter a UPC code from an Annie's product, i.e. 013562302109 - Purchase date entered must be 8/1 or later) Click HERE to request.